Architecture that brings you to a more opulent time in history, the Beaux-Arts details are courtesy of the architectural firm Warren and Wetmore, the same firm that's known for placing tongue-in-cheek details in historic monuments of the time. The official name is Grand Central Terminal, but ask a New Yorker where it is and they'll look at you like you asked for directions to Mars. The name changed in 1913, but native New Yorkers still call it by it's old name Grand Central Station. Speaking of tongue-in-cheek details, you may have noticed the blue-green, Paul César Helleu ceiling mural of the zodiac. What you probably didn't notice is it's backwards, as the artist's intent was to make the viewer feel like they were being privileged to a divine perspective from a transportation hub fit for deities. An ambitious goal for subway art. Track 61 is one of the oldest kept secrets at Grand Central Terminal. Long thought abandoned, it is nicknamed The Waldorf Astroria Track. It hosts a luxury train that has been used since WWII for shuttling VIP guests from the terminal to the Waldorf Astoria hotel. President Roosevelt was the train's most famous passenger, who used it to hide the fact that he was wheelchair bound due to polio. Grand Central Terminal was a place of innovation, the use of ramps instead of staircases to navigate the levels and the multilevel passenger drop-offs influenced modern airport design. Grand Central is a meeting place (next to the big clock of coarse), transfer point and historic landmark in New York and holds some of the most amazing art and architecture within it's walls. Vanderbilt Hall often has rotating exhibits by local and international artists, and during the holiday season the terminal is decorated with a festive light show. The terminal houses a number of shops, including Park Slope based Beer Table To Go, and the Grand Central Market. The Grand Central Market has a collection of quality food vendors like Penzey's Spices, Murray's Cheeses and Zaro's Bread Basket, where you can score some delicious treats, like a prosciutto baguette to go. Hungry but don't want to leave the building? There's 35 restaurants to choose from, but the only ones worth checking out are Junior's for their plain cheesecake, or seafood from The Oyster Bar. Train delayed and you've got an hour to kill? Grab a drink at the Campbell Apartment, a prohibition themed bar in the former office of American financier John W. Campbell. Actually riding a train departing from the Terminal? Since Amtrak started departing from Penn Station, the Terminal is exclusively a Metro Transit Authority (MTA) hub. Subways depart on a frequent service schedule, but if you're taking the MTA North Train you'll have to check the MTA's website for train schedules. Not happy exploring the station with a map and what we just told you? 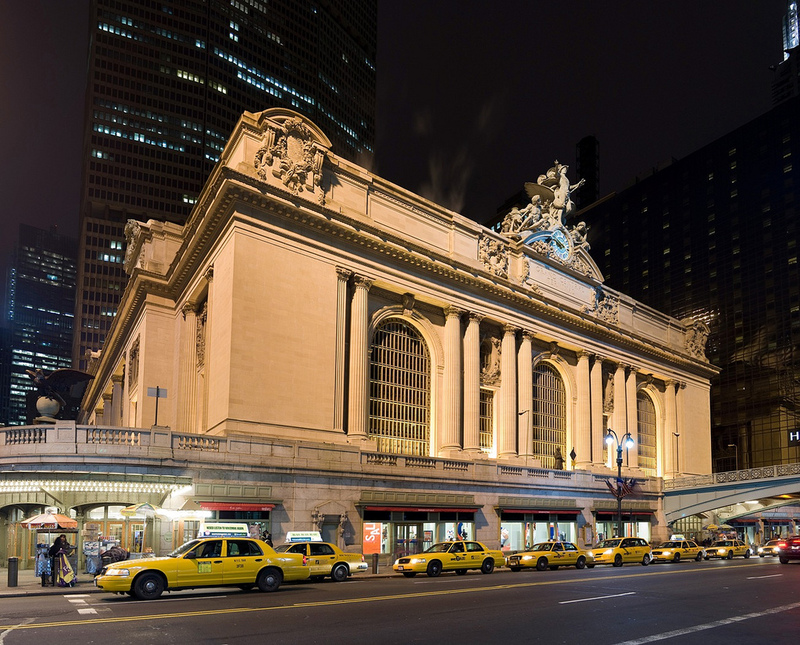 The Municipal Art Society of New York gives the official Grand Central Terminal Tour (US$20), a 75 minute long walk-through of the world's busiest train station.